In 2000, You couldn’t even imagine ordering a pair of shoes and getting them same day. Now it’s a standard. Darkstore is reinventing how users order products, brands store them, warehouses fulfill, and then delivered same day. I was part of this ambitious project to redesign the Darkstore logistic platform experience and warehouse app, knowing that technology innovation and digitization are disrupting most part of these industries. Our goal for the project was to rekindle interest in the complete Darkstore experience for the benefit our current brands—Further designing for future brand delight. The original idea was to take a birds eyes view of the current user experience, and not smash it with a hammer, put to nicely chisel away until Michelangelo’s David appeared. Make it fast and easy to use. Give Users more control over their tasks. Create an updated platform for deeper user engagement. I led the design of the freight and fulfillment experience between November 2018 and February 2019. I collaborated with internal operations managers and warehouse workers on features to enhance both the app and platform. In addition, I worked alongside developers, a project manager, and our customers. In February I stopped working on the project during I first phase of this process. I lead the upgraded functionality of the platform, and the app. The app sceens were de-scoped, but I am looking forward to the project being launched later on this year. 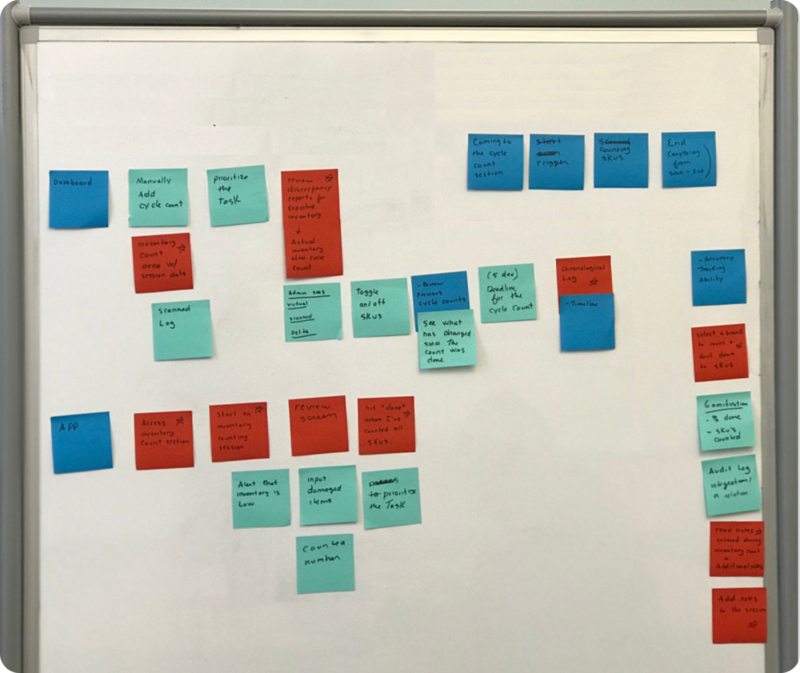 I created a visual map, using the operations team as a sounding board to map out the current Darkstore experience with a goal to communicate current motivations, goals, and behaviors. I started by gathering information. I talked to real users who’d used the product daily. I needed to understand the why and how. From this I created two provisional personas to help me communicate the users’ motivations, goals, and behaviors. Job: Oversees Darkstore warehouse orders. Analyzes and improves processes. Pain points: Not enough manual checks within the warehouse, most days are spent tracking down lost orders. Pain points: Not understanding the urgency of some orders, and where new Darkstore products are located the warehouse. I decided it was a great opportunity to rethink the entire user experience, rather than just port over the features as is. At the outset of the project we had a clear mission and goals for the experience. I had no logistic experience so, I partnered with our warehouse team to explore how products were checked in, fulfilled, and delivered. In edition I had our operations team close-by to ask overall infrastructure, and the day to day operational environments questions. Warehouse is Hayward, California…Where all the magic happens. I observed 2 warehouse workers using the existing Darkstore app. This included checking and scanning in morning freights, checking orders, and compiling orders for delivery. Our goals were to understand the challenges and painpoints that happen in the warehouse between the time a product enters and a product leaves for delivery. Items were sometimes partially fulfilled. When this happened operations managers have to spend valuable time finding out why. App users were often frustrated using the built in scanner, resorting to using the physical scanner. Both Operations and Fulfillment partners need to talk to each other in real time if there are going to any late or unfulfilled orders. Some of the buttons were causing confusion, or selected incorrectly. Before I could jump into designing, it was important to define success and understand experience at scale. Prior to the redesign, the inventory had never been counted on a regular basis. This was the root of the problem. In edition, we started reviewing our pick paths and making the effort to rearrange storage locations by improving picking efficiency and keeping labour-related costs down. For the future few were heading toward location based picking modeled to save time, space and frustration. Many issues were coming to the surface. After some thinking, it became clear that some fo the main problems could not be fixed with better user experience, it was a people management problem in the warehouse. Bad communication practices and Inventory issues caused a snowball effect. The warehouse app makes this problem worse by having inconsistent UI, and inventory consistency. Lack of inventory consistency, makes order fulfillment almost impossible at times. There needs to be a way for additional communication to happen and to create a better plan of attack, which then leads to less frustration and time lost. We created a quick and dirty user flow proposal to create a better inventory section in the app, and means to make notes and alerts platform wide between Darkstore and the warehouse, further trickling down to more accurate delivery, and user delight. Our Operations managers were crucial in getting this framework started. Current model for Darkstore. Pallet racking systems hold inventory system. Boxes are placed on the pallet racking system with the help of a forklift or an automated mechanism. This was great for Darkstore during our beginning phases, but for better efficiency we needed something else. Future model for Darkstore. The pick and pack method system of preparing and shipping entire cases and pallets of goods, relies on workers who pull (pick) individual items from master cartons on warehouse shelves. The main goal was to ensure that all members of operations team can perform tasks respectfully in unison with the app. A good operations team leader addresses differences and conflicts immediately. Addressing faster conflict resolution requires a better communication system. Darkstore optimized a notes section across the platforms to create the fastest, most time effective way to solve the problem across both freights and orders. When something happens that effects the freight the user now can write a note to create context. The key to maintaining accurate inventory is having an established method of cycle counting. Darkstore saw accuracy of inventory a way to affect a small business's ability to forecast better, and ultimate scale faster. 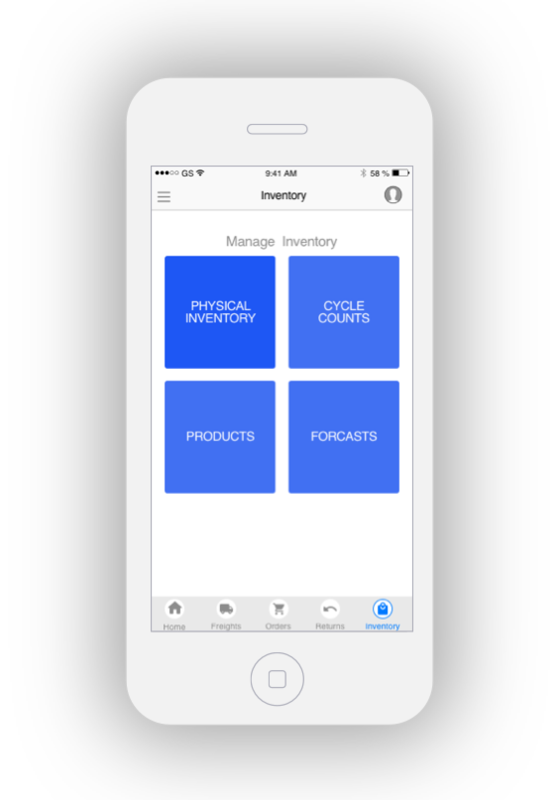 Clarified inventory sections creates transparency and further prevent problems. Ops can create cycle counts when they are needed. Operations team members can adjust inventory count problems immediately. Below is our inventory management concept. It save time by connecting the platform to the Apps inventory, and streamlining key tasks like Inventory discrepancies and order fulfillment. The main goals were to find the ideal logistics plan for brands based on, location, order volume, and where a product was going. Stop logistic issues in the warehouse by creating easier location based picking. Do time efficient measure on behalf of the order volume. Shave off time in the fulfillment process. Capitalize on communication updates that may minimize problems with freights or orders down the road. I jumped into sketch to create Low-Fi mockups of my first design. Brain storm feature priority and sprint scope with the developers. Brain storm feature scope with the team. We upgraded the order systems to clarify all part of the order’s journey. Architecture needs to support your User Experience. When planning, we narrowed in on target functions to clearly define our user’s pathways. Bucketing information into useful categories can direct the user faster towards their goal. Not keeping proper tabs on your stock can be costly. Cycle counting, is a simple way to easily generate metrics that tell you how you’re performing. Through this case study, the sheer amount of work put into accurately creating a complete logistic system was a great challenge. I had to keep in mind that all of this is a process and it will take time, as well as some trial and error, before finding systems that work. With hard work, perseverance, and the right inventory management tools, the day-to-day operations will fall into place. I left the project before we had time to test design solutions, but I am looking forward to seeing it shipped later this year. Please feel free to ask, to see a more in depth version of this project with more screens.